Good morning Yankees family. Tonight in the Bronx the New York Yankees and the Boston Red Sox will continue their three-game weekend set in the Bronx with the middle game of the series. After last night’s southpaw showdown we will be treated with another lefty in Boston’s Chris Sale while the Yankees will counter with right-hander Sonny Gray. 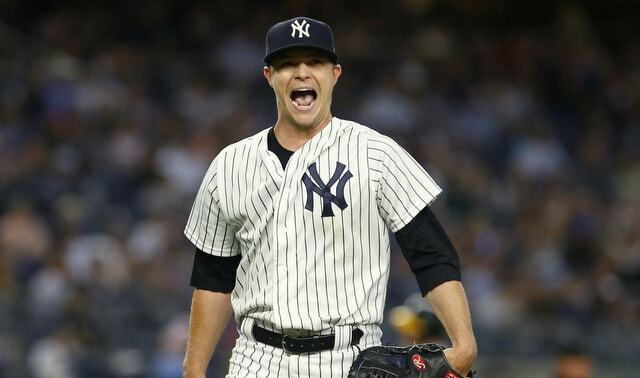 Sonny Gray at home, instant shudders sent down my spine. Sonny Gray at home against the Boston Red Sox, I’m beyond shuddering, and I am literally shaking. Sonny Gray at home, against the Red Sox, and on FOX on a Saturday night… I’m dead. Let’s get this thing over with to it here in the Bronx. Gray took the loss in his last start against the Tampa Bay Rays much like he took the loss in his last start against the Boston Red Sox on April 12. In that start against Boston the Yankees righty allowed six runs in three innings in a loss. Meanwhile in his last start in Tampa the Yankees right-hander allowed four runs on six hits in 6.2 innings of work in another loss. Gray is 5-5 on the season. Sale has enjoyed another strong season in Boston here in 2018 and has been especially tough as of late, the perfect storm if you’re a fan of the Red Sox. Sale has struck out at least nine batters in each of his last four outings and will look to build on a strong start against the Yankees back on April 10th where he struck out eight while allowing eight hits and one run in six innings of work. The game will be played at 7:15 pm ET inside Yankee Stadium and can be seen on FOX. You can also follow along with the game on MLB TV, with the MLB At-Bat app and by tuning into the Yankees radio broadcast with John Sterling and Suzyn Waldman on WFN. Enjoy the game, it is high… it is far… it is caught by the second baseman in short right field for the out… and go Yankees! !